If you are over 18 you can participate in a rope induction. Here you will learn how to put on a harness, tie a figure of eight knot and belay a bottom rope. 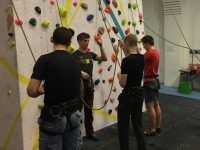 Once you have practised these rope skills over a few sessions you will be able to register as an Adult Roped and Bouldering Member. 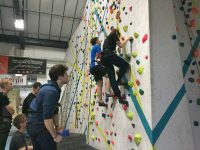 Each 90-minute session costs £20 per person. We require a minimum of two people to run a session, and most people need at least two sessions before they’re ready to get signed off. We don’t run regular Rope Inductions but they can be booked at your convenience – if you’re interested please contact us or talk to reception. We may be able to partner you up with someone else looking to learn at the same time.